The EHT high-power nanosecond pulsers are designed for industrial customers or researchers with higher power needs. 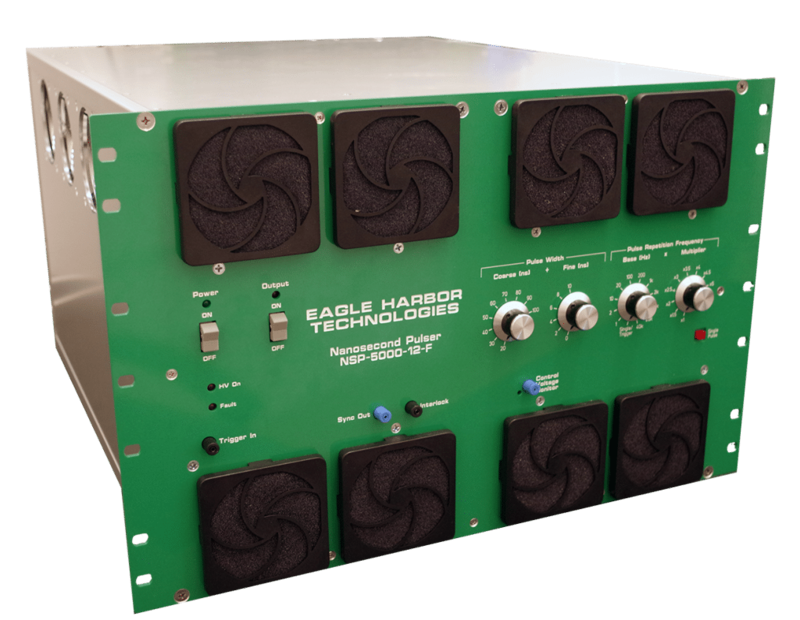 These units offer user adjustable waveforms including independent control of the output voltage, pulse width, and pulse repetition frequency. This flexibility allows researchers to optimize the output to their application, while offering industrial customers precision waveform control to manage their processes in real time. The pulsers have three output voltage ratings in each power class. These units are turnkey systems, where an approved external DC voltage power supply is provided, but external pulse control is not required. For applications that require synchronizing the pulser with diagnostics, a fiber-optically isolated trigger is available (optional). See the table below for specifications. Floating output (cannot be grounded): This option is the standard and strongly recommend as it reduces electromagnetic noise, makes voltage measurements cleaner, and produces the fastest rise times. Positive referenced output: For applications that require grounded pulsers, the output can be internally grounded at the factory so that the pulser produces a positive voltage. Negative referenced output: For applications that require grounded pulsers, the output can be internally grounded at the factory so that the pulser produces a negative voltage. Resistive Output Stage: The resistive output stage is recommended in most applications to ensure that the pulser is safe to shorts and open loads. Rapid Capacitor Charger: Allows users to charge larger capacitors (typically > 500 pF). The waveform images below show the pulse characteristics (load dependent) of adjusting the pulse width from 20 ns (left) to 100 ns (right) while maintaining a 20 ns rise time.